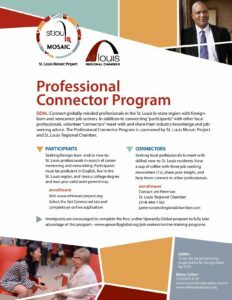 St. Louis Mosaic Project’s Professional Connectors Program, in conjunction with St. Louis Regional Chamber, introduces skilled immigrants and newcomers (or considering a move) to well-known “connectors” for career networking referrals. When connecting globally-minded professionals in the St. Louis region with foreign-born and newcomer job seekers, the result is astonishing because participants meet with other local professionals who share their industry knowledge. Additionally, the Professional Connectors Program works with local universities, companies, organizations and agencies to recruit newcomers with the goal of helping them launch their careers. This initiative is based on an award-winning program in Halifax and sponsored by St. Louis Mosaic Project and St. Louis Regional Chamber.